Add a touch of classic contemporary style to your sleeping space with this three piece quilt set from Southshore Fine Linens. 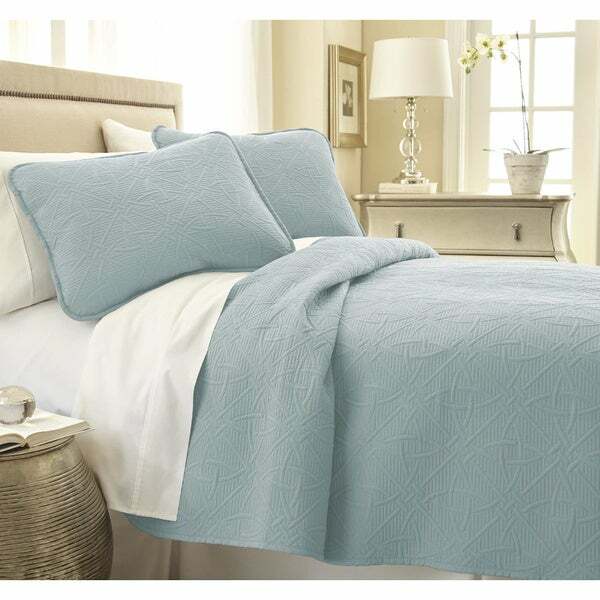 Crafted with a combination of brushed microfiber and synthetic fiber materials, this quilt set is a soft and durable choice for any bedding ensemble. One comfortable quilt and two matching shams make up this classic set and come in your choice of 12 different colors to suit your personal styling needs. Love the quality, feel, and look of these quilts (bought two) so much, that I bought two more from Southshore Fine Linens in a different pattern for a different room. They wash up great and are very well-made. The color I bought was Sky Blue. It looks more like a soft/muted aqua, which is exactly what I wanted. Love this quilt set. The quality is amazing for the price. We got these for our elderly parents' adjustable beds (xl twin). It is a nice weight--not too heavy and not too light. We're in Wisconsin, so I was a little concerned that several people had mentioned it was a light weight. I think they will work well for them. I didn't want something they would find hard to move as they get in and out of bed. The fabric is very nice. I have washed them once and had no pilling. We got the teal. It is a soothing and pleasant color. This quilt set was very nice for the price. Very happy with it. Love the quilt. Beautifully made, Oversized, and beautiful modern pattern. Two shams are a great bonus. Love it! It was thinner and stiffer than I expected. Felt cheaper, almost like a hotel blanket. It felt better after a few washes, but still isn't exactly what I was looking for. The color and pattern are nice and subtle. It's a nice light cover for the summer months. And the fit is right for a King/Cal King bed. Great texture, love the color and patterns, not too hot. It covers the bed. Not sure what else I can say about this thing... it's just fine. The color is as expected and the quality is good. Happy with purchase. I am using this on an extra bed and have found that it adds a nice touch when pair with the red area rug I purchased at Overstock. The Quilt is solid well made! But to stiff for us. I returned this. 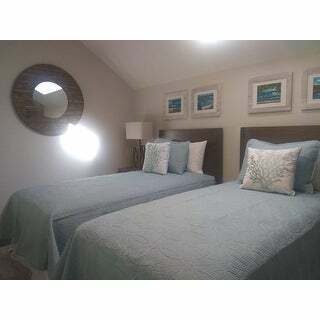 Once I received them, I realized that I really wanted a comforter looks for the room. There is really nothing bad to say about it. It just didn't work for me. Sheets fit perfect,nice & soft to the touch. Beautiful, light weight and easy to clean! And obviously great price! "Anyone have experience purchasing the grey...is it "grey" or does it seem a bit lavender? I've had trouble with some grey colors looking sort of lavender once I get them out of the package. Also, a black version is pictured but not offered for sale...are they sold out? Thanks." Our Grey does not have a lavender tint to it. We are currently out of the black color. "Has anyone hard this a while and can you tell me if it gets softer over time? I keep hearing it is very stiff. I want to get it and love it but not sure unless it gets softer over time. Thanks"
I bought these for my elderly parents. I washed them before using them. I would describe the fabric as soft to the touch but the quilt itself holds its shape. That is probably what people are describing as "stiff." It is not a cuddle up type of quilt. It lays nice on the bed and looks good. It is a light-weight quilt, but my parents have both been very comfortable with this quilt, even my dad who was always wrapped in several blankets in their previous home. I am very pleased with these quilts for my parents. They wash up nice every time. No pilling so far. They have used them for four months in assisted living. "I love everything about it, design, light weight, fits great, made very well, but even after washing it is stiff. My husband claims cardboard might be softer."